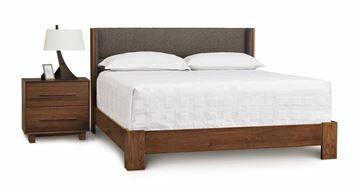 The Berkeley Storage Bed by Copeland Furniture. Crafted in solid cherry, the design is a unique fusion of Copeland craftsmanship and Asian inspiration. Thanks to the designed platform internal structuring, a box spring isn't needed with this bed. Crafted in solid Cherry with American black walnut accents, the Berkeley collection features a variety of cases. Made to Order in several cherry finishes, all of which are GREENGUARD Certified for low chemical emissions. Four storage drawers are mounted with premoum quality drawer tracks; no attention to detail and quality is spared with Copeland Furniture. The Berkeley Bed by Copeland Furniture. Crafted in solid cherry, the design is a unique fusion of Copeland craftsmanship and Asian inspiration. Thanks to the designed platform internal structuring, a box spring isn't needed with this bed. Crafted in solid Cherry with American black walnut accents, the Berkeley collection features a variety of cases. Made to Order in several cherry finishes, all of which are GREENGUARD Certified for low chemical emissions. 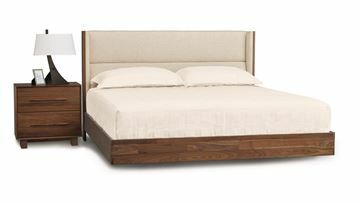 The Astrid Walnut Bed by Copeland. 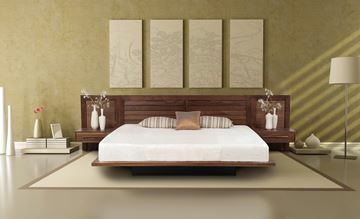 This iteration of the Astrid Collection is configured with a single panel headboard, entirely solid walnut. The Asterid design is a true platform bed, featuring deeply splayed legs and a dramatic cantilever design. Astrid is a tremendous statement design by Copeland Furniture. The headboard panel is height adjustable between 36" and 39". This is a great feature making the Astrid bed easy to accommodate your preferred look with the height of your mattress. The Astrid Two Panel Walnut Bed is a true platform bed, featuring deeply splayed angled legs and a unique cantilever design. Crafted in solid walnut. Astrid is a tremendous statement design by Copeland Furniture. The headboard panels are height adjustable between 40" and 44". This is a great feature making the Astrid bed easy to accommodate your preferred look with the height of your mattress. 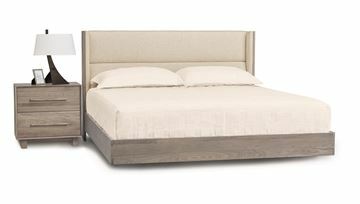 The Astrid Maple 2-Panel Headboard Bed by Copeland. 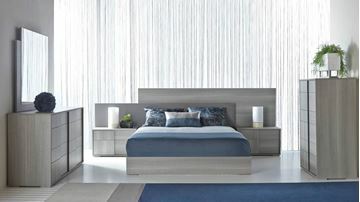 Copeland's Asterid design is a true platform bed, featuring deeply splayed legs and a dramatic cantilever design. Astrid is a tremendous statement design by Copeland Furniture. The headboard panels are height adjustable between 40" and 44". This is a great feature making the Astrid bed easy to accommodate your preferred look with the height of your mattress. The Astrid Maple Bed by Copeland. This iteration of the Astrid Collection is configured with a single panel headboard. The Asterid design is a true platform bed, featuring deeply splayed legs and a dramatic cantilever design. Astrid is a tremendous statement design by Copeland Furniture. 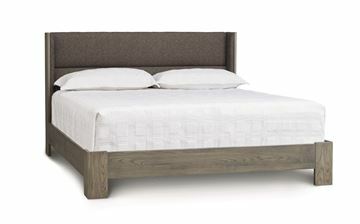 The headboard panel is height adjustable between 36" and 39". This is a great feature making the Astrid bed easy to accommodate your preferred look with the height of your mattress. The Astrid Solid Cherry Bed by Copeland. This iteration of the Astrid Collection is configured with a single panel headboard. The Asterid design is a true platform bed, featuring deeply splayed legs and a dramatic cantilever design. Crafted in solid natural cherry. Astrid is a tremendous statement design by Copeland Furniture. The headboard panel is height adjustable between 36" and 39". This is a great feature making the Astrid bed easy to accommodate your preferred look with the height of your mattress. The Astrid Saddle Cherry Finish bed is a true platform bed, featuring deeply splayed legs and a dramatic cantilever design. Crafted in solid natural cherry. Astrid is a tremendous statement design by Copeland Furniture. The headboard panels are height adjustable between 40" and 44". This is a great feature making the Astrid bed easy to accommodate your preferred look with the height of your mattress. The Astrid Autumn Cherry Finish bed is a true platform bed, featuring deeply splayed legs and a dramatic cantilever design. Crafted in solid natural cherry. Astrid is a tremendous statement design by Copeland Furniture. The headboard panels are height adjustable between 40" and 44". This is a great feature making the Astrid bed easy to accommodate your preferred look with the height of your mattress. The Astrid bed is a true platform bed, featuring deeply splayed legs and a dramatic cantilever design. Crafted in solid natural cherry. Astrid is a tremendous statement design by Copeland Furniture. The headboard panels are height adjustable between 40" and 44". This is a great feature making the Astrid bed easy to accommodate your preferred look with the height of your mattress.